you might find this link interesting. i did. 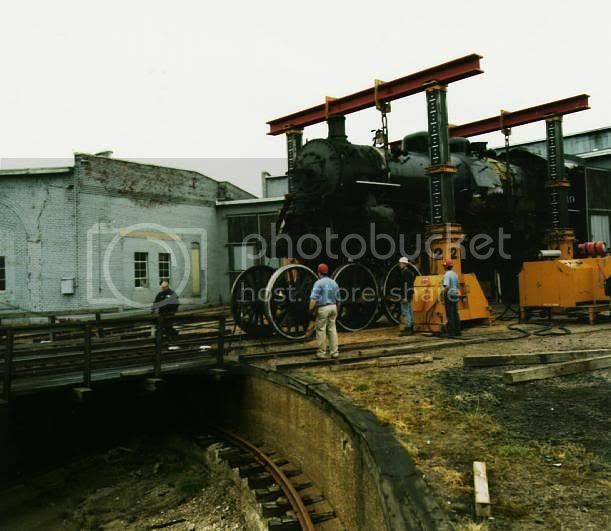 The locomotive they propose to use as a test bed is an ATSF 4-6-4 that was stuffed and mounted in a park in Topeka, KS. I officially volunteer to give it a test drive. You don't even have to pay me. which has caused a huge drop in the price. Truck fleets are being converted from diesel to compressed natural gas to take advantage of the much lower $/mile cost. Truck stops are being outfitted with NG compressors and filling equipment (infrastructure). The new solid fuel for the train looks like ground up trees or other plant material. I can't imagine cleaning a plant fired boiler can be as easy as cleaning a compressed NG boiler. One of the reasons that diesel locos took over so rapidly was that boiler cleaning was such a onerous and dirty task that no one wanted to do it. Another thing, isn't internal combustion more fuel efficient than external combustion (boiler)? I went to school there.....so its hard for me to say they should be on a different track, fuel wise. I don't know why the school hasn't changed their heating plant over to natural gas a long time ago. nnatural gas was tried in diesel locomotives about 20 years ago. it was found to run hotter than diesel, with the 2 sd40-2s bn converted getting larger sd45 radiators. it also resulted in a 20% reduction in horsepower. i would expect similar results from a gas fueled boiler. another problem was that the gas had to be liquified in order to have enough fuel capacity. this meant cooling to about 200 degrees below zero. i can't imagine supercooled gas and water being hauled in the same tender. i can't imagine supercooled gas and water being hauled in the same tender. that LNG is not a very concentrated source of energy. I don't know how we got from Biocoal to natural gas. Many steam locomotive in parks run on propane. The ones hear in eastern Okla. tanks on the tenders. They have wood lined up around them to make them look like woodburners. Because the csrail site ignores natural gas, which is more abundant, cheaper and cleaner burning than bio-coal. They are looking for a research grant from the government. If a proposal has any of the words "green", "bio", "renewable", "carbon neutral" or "train" in it, they stand a better chance of getting tens of millions from the present administration. All a waste that the taxpayers can't afford. Hate to say it, but you don't need to restore a stuffed and mounted steam loco to test bio-coal's overall cost. They talk of modernizing the steam loco to make it more efficient. Well, you just have to look up Andre Chapelon's work from the mid 1900's to see how much more efficient a steam loco can be made. Costs should be compared to other fuels, to include some form of (cheap and abundant) natural gas. The coal fired heating plant at the U of MN Minneapolis campus (mentioned on the csrail site) should have been converted to natural gas decades ago. Now so more than ever with the glut. natural gas can be used in compressed form in smaller vehicles such as utility trucks, busses, and that abusement park train. these vehicles are small in mass, and remain relatively close to refueling points. to use gas in the quantities needed to move heavy trains at high speeds you need to liquify the gas. this brings the need to supercool the gas, and to ensure it stays cool enroute. burlington northern used fuel tenders converted from insulated tank cars. these also had an active cooling system. overell, their experience was than the technical problems negated any cost savings. this was especially true considering the 20% reduction in horsepower associated with LNG as opposed to diesel. the most successful application of natural gas in railroad use was several yard switchers in los angeles. once again, relatively small mass vehicles in a low speed application, kept close to a refueling point. completely different than hauling trains on the main at track speed. Diesels have higher compression, therefore are more powerful and efficient than a spark plug engine. How many miles can the current diesel trains go between refueling stops? Will the stopping distances with water and bio-fuel be comparable? Will the time spent refueling (diesel vs. bio-fuel and water) be comparable? and therefore reduce water stops? Would they bring out track pans and tender water scoops instead? Cheap and abundant still drags me back to NG, so, what about electrified routes fed by NG fueled electrical power plants? Good questions. I'll answer what I can. Current diesels have huge fuel tanks and can go several hundred miles before refueling. Stopping distance is a function of mass, adhesion to the rails and the mechanics/physics of the brake system. Water versus biofuel make no difference. With mass and adhesion held constant, only the mech/phys of the braking system influences stopping distance. A diesel- or biofuel-electric can use highly effective dynamic braking which a steam engine cannot, regardless of whether it burns coal, oil, wood, other biomass or manufactured biofuel. Advantage: Internal combustion. It can take a while to top off a tender with water. Fueling takes time, too, but coal can be pretty fast. I would assume that the amount of time needed to pump comparable quantities of diesel, bunker oil or LNG would be roughly similar, but lower energy LNG would necessitate more gallons per fill or more frequent fills to load the same amount of energy. Therefore, LNG fueling would effectively be a somewhat slower process due to fewer calories in a given quantity of fuel. Plus, a LNG steam engine would need those long, frequent stops at the water plug for water treated to minimize scale and corrosion. All of that equals more time and expense, and another advantage of internal combustion. Condenser locomotives saw limited use in the United States because of the massive scale of American railroading. It isn't really helpful except for low power / low speed trains of which this country has had very few since the early days of railroading. Besides, condensing locomotives sacrifice some (sometimes a LOT) of their power to the condensing process itself, the last thing you'd want to do to a locomotive already handicapped by its less energy concentrated fuel. There's no way that a railroad could save enough time or money using condensing LNG-fired locomotives to justify the cost and power reduction. No advantage to internal combustion here, but no boon to external combustion, either. Water on the fly? I don't think so. Only a few Eastern railroads did this years ago and that was long before the costs of obtaining, treating and transporting water and servicing water supply facilities got to where they are today. The highest cost to the Western railroads after maintenance of steam engines was water. If they couldn't make it work 75 years ago with cheap water they sure aren't going to have a prayer at current prices. Not to mention the amount of expensive water which would simply evaporate in track pans in the desert sun through which the Western railroads run so much of the time. But ... LNG running electric plants, whether for general use or electric railroads probably has merit. LNG and LPNG fuel many electric plants already and are the most common back-ups when oil and coal prices go up while their availability goes down in the winter. There's no reason to believe that equation would be materially different were LNG to be the primary fuel for a power plant. The reason it isn't done much now is that we lack the infrastructure to constantly move huge quantities of LNG. So NG is flared off in the oil fields and at refineries. I think it would be terrific to harness all of that energy which just heats and pollutes the atmosphere now. Is there a future for LNG in railroading? Probably. But I predict it will be limited and it won't happen on the go. Poor choice of words in my previous post: "stopping distances". What I meant was "distances between fueling/water stops". My concern was that "too many" and/or "too time consuming" pit stops would make the steam trips so much slower/longer than diesel trips as to make them undesirable. Another problem, water or fuel stops blocking the main line....Might have to build sidings long enough to park any length steam train. the last attempt in this country to build a modern steam locomotive, the ace3000 project of the 1980s, envisioned using dumpster like containers preloaded with coal. this modular fueling could in theory be accomplished in minutes. perhaps they envision something like this for this project? water stops would still be a problem unless they haul an auxilliary tender like n&w did. Good point! Railroads today are quite congested so blocking the main to take on fuel or water could stack trains up quickly. Even supply sidings would be a problem because time out of motion could screw up timetables and dispatchers' plans. Lots of people don't realize just how busy tracks are these day, probably because we rarely see trains or tracks anymore. And that, you might say, is the root of the problem. So much track has been pulled up that what's left has constant traffic. There are far fewer actual trains today than 50 or 75 years ago, even disregarding passenger trains' demise, but what are left are long, fast and frequent. Keeping it all moving in a timely manner requires careful planning and accurate scheduling. Throw in protracted or frequent fuel/water stops, on or off the mainline, and the system will be severely challenged.